Recommended for people 5'4" to 5'10"
Kick your floor routine up a notch when you incorporate a 65cm Anti-Burst Yoga Balance Ball! Our top quality Pilates balls are perfect for resistance routines and core work. Made from durable and slip-resistant vinyl, this exercise ball is designed to withstand up to 600 pounds of pressure. Swiss balls ship deflated and can be inflated within minutes! 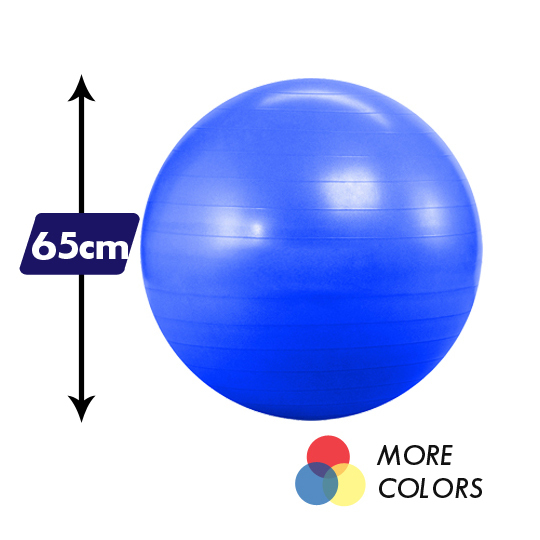 This yoga ball should be the right size for most people: from 5'4' to 5'10" tall. Kids love these balls, too! Comes in bright colors to choose from. I'm happy with this purchase. Excellent quality! I have replaced my office chair with this ball and alternate between standing at my desk and using the stability ball. I am very pleased with the product and it is exactly what I expected. Exactly as specified. This looks like a rugged piece of equipment that will hold up well in my studio. I had a major back injury last year and I''ve been in physical therapy for the past couple of months. My PT recommended that I purchase my own yoga ball to use at home to speed up my recovery time. I searched the internet and found this one that included a pump. I weigh over 300lbs and this ball can hold me and then some. My back feels so much better already. I take a yoga class and bring my ball with me everywhere. I can''t travel with it blown up so I deflate it and blow it up all the time and it is so easy to do so. It was a great thing that it came with a pump. That was the selling point for me.